Please Note: Description and images are provided to us by third party for your convenience only and we cannot guarantee their accuracy.We apologise in advance if they contain any errors. Product images are for illustrative purposes only and may differ from the actual product.If in doubt please search on manufacturer website using Product Model: 458510 or Contact us via Ask a Question Tab. Get organized, simplify your life. 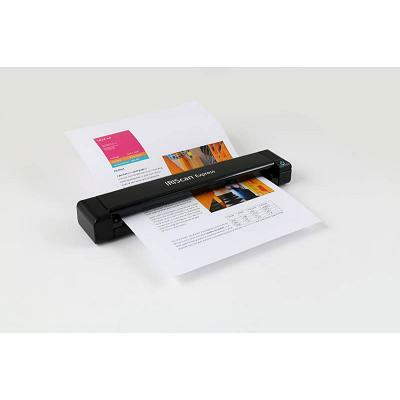 The IRIScanTM Express 4 is a powerful combination of a fully portable color scanner and a breakthrough and easy-to-use OCR software. Compact, light- weight and USB-powered, one click PDF at fingertip, it is the fastest single sheet fed por-table scanner on the market, and is designed to be carried any- where. IRIScan Express 4 allows users to define easy document process thanks to the intuitive unique Button Manager. The digital Button manager transforms in a snap, your mobile single sheet fed into a mobile multiple sheet fed scanner! But that’s not all. The provided world-renowned OCR software suite will extract all key information from your scans easily. Your documents are turned into fully editable files ready to be shared in the Cloud, and your business cards are saved as digital contacts within your favorite contact management system. What is the sum of 3 and 8 ?